THE VESPERTINE about Saundra Mitchell is a beautiful, dynamic tale about a girl who can, for just a moment, know the future. 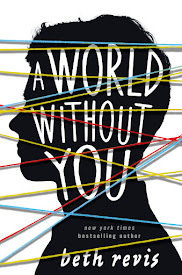 With intrigue, romance, and a touch of magic, this novel doesn't just take you to a different place--it takes you to a different time. THE VESPERTINE takes place in Baltimore, 1889. To create the world of THE VESPERTINE, author Saundra Mitchell did copious amounts of research, creating every detail with precision accuracy. I've always been fascinated by Japanese history and culture, and after studying the literature of this time period specifically, I'd love to be able to enter this culture and see what it was really like. I think I'd most like to be a friend--perhaps a member of court or a lady-in-waiting--to Murasaki Shikibu. Or just a fly on the wall. The clothes, the culture, the people...I find it all utterly fascinating and long to be able to slip into this world. I know my British monarchs, y'all, and the best, by far, is Tudor England. Oh, man. If I could, I'd love to see the soap opera of Henry VIII unfold in real life. I'd be an unimportant and unobserved lady-in-waiting, and I'd watch all the crazy happen right in front of me. Or, perhaps, I'd be the mousy and quiet bff to a young Elizabeth I--I'm most interested in the last years of Henry, the short years of Edward and Mary, and the beginning of young Elizabeth's reign. I also find the religious upheaval of the time vastly interesting. So, what about you? What time period do you wish you could visit, or that you wish you knew more about? 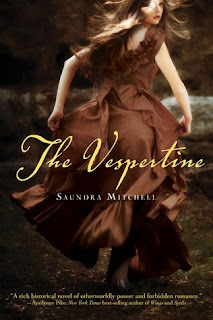 If you go to Saundra's blog and tell her about your favorite time period in the past, you could win a signed copy of THE VESPERTINE. If you blog and/or tweet (use #PPF hashtag--past, present, future) about it, too, you'll get extra entries for her drawing. Remember: while I would LOVE any comments here, to be entered for Saundra's drawing of THE VESPERTINE, you have to comment on HER site. 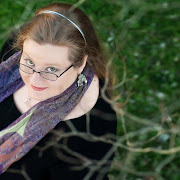 That's two chances to win--one for a grandprize of all three books, one for a signed copy of THE VESPERTINE from Saundra herself! I was going to say "I wish I could go back in time and be Agatha Christie's bff so I could see what happened to her during those mysterious missing days," but then I remember OF COURSE, that's when the giant wasps attacked and David Tennant had to save the day. AGAIN. Well, really, Donna saved the day in ALL of them. Even in the episodes when she wasn't a companion. She's that much of a BAMF. I've heard she's kind of a big deal. I'd definitely go to the Tudor times too. I think, though, that I'd like to live through all of Elizabeth's Reign since it's so freaking interesting. I think I'd also like to go back to the very early days of civilisation- Greeks, Aztecs and Egyptians and perhaps further. I'd like to meet geniuses too: science ones like Newton, Einstein and Tesla; but also literary ones like Shakespeare, Dickens. If I had to choose though, I'd say Ancient Greeks: I could meet Euclids, Socrates, Plato, Pythagoras; and see Sparta and Athens in all their Glory. Tudor England is a great pick! I'd want to be around during the whole Henry VIII/Ann Boleyn craziness. I'd also like to visit the time and place of the "real" king Arthur. 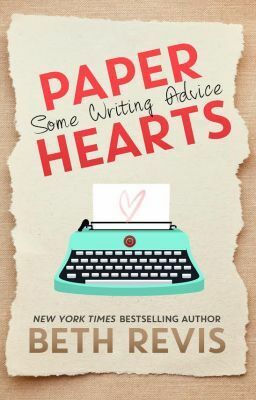 I'm in the middle of reading this book right now! I agree with Tudor England. I'd also want to go back to mid-1700's Scotland, and I've always loved the Revolutionary War and Civil War eras as well. I'm a huge history buff and I'm hoping for my next story to do a historical fiction piece. I just want to say I heart the word "anywhen." Totally considered it for a title for my ms. Sigh. I love history and really cool historic places. But Black Plague? Yeah, you're crazy. Aside from that, I'd love to travel back to Tudor England or be around for the Black Plague...as long as I don't die. It's all good if I come out without a disease that wiped out so many people.